I wanted to make this chilli sauce, but then realised I didn’t have enough vinegar, and also wanted to use up the eight long capsicums I had, (bull horn’s.) So I fiddled a bit, a little tweak, a whispered please let it work and hey presto… capsicum chilli sauce. I think I actually like this one even more than the other as it’s a little less sweet, leaves the taste of the capsicums and still gives a dish the kick I want it to. In a food processor, blitz the capsicum, chilli, garlic and ginger. In a pot add add the remaining ingredients, add chilli combination and bring to a rolling boil. Keep at the same temperature, stirring until sauce thickens. Poor in to sterilised glass jars/ bottles or in to a clean jar and store in the fridge. 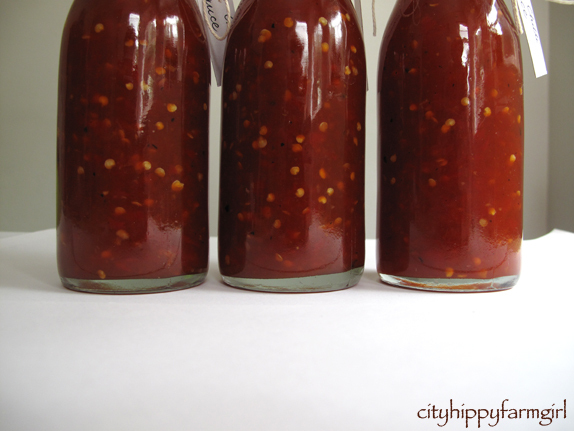 This entry was posted in Food Glorious Food, Making, Creating + Frugal Living and tagged bell peppers, bull horn peppers, capsicum, condiments, easy, frugal cooking, gift ideas, home made, how to make, peppers, simple recipes, sweet chilli sauce by cityhippyfarmgirl. Bookmark the permalink. It does have a kick, I won’t deny that 🙂 but not crazy hot… just a little oooohhh yeahh. …and no to the capo’s unfortunately. The pots aren’t particularly happy at all this summer. I’ve finally finished the bottle- very very tasty! Thankyou! Glad you liked it Nimity. wow..this looks so good..i have a whole lot of chillies growing that i dry but i’d love to try this with some of them..
ahh, I would love to grow a whole heap of them. What I do grow is just a token few here and there. Let me know if you do try making it Jane. Your bottles of sauce look so professional Brydie! That’s a nice looking recipe. Thank you Rose. I think I’m due to make another batch, it never seems to last long. The sauce looks very tempting, but gosh you have beautiful handwriting! Brilliant! What a wonderful thing to make yourself. You can’t go back once you start making it yourself. What beautiful bottles. 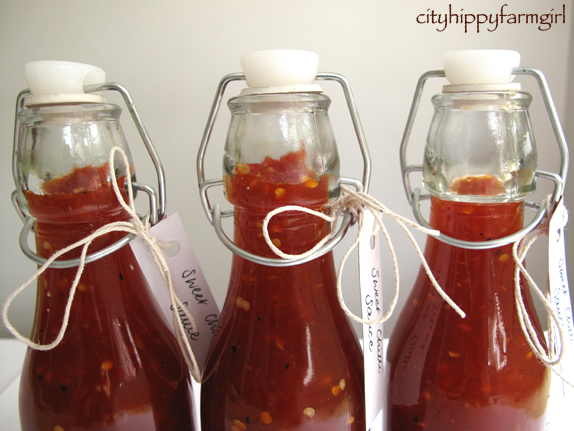 You capsicum chilli sauce bottled like that would make wonderful gifts. The ingredients in the recipe sound delicious. For a household that relies on commercial sweet chilli sauce far more than I would like, this recipe is like gold 🙂 Thank you! The sauce looks great! I like the combination of chillis and capsicums for a more restrained heat. I am definitely bookmarking this one as we go through a stack of sweet chilli sauce! I think the added capsicums leaves a more subtle flavour, a bit more sweetness, which I quite like. I have been looking at our birds eye chilli bush with anticipation, ready to make a good sweet chilli sauce. I love the bottles and the labels…where do you get bottles like those?? Dollar Dazzler shop Kim, and as the name suggests, they weren’t expensive… but they look good! mmm,” ficy” foods can be tricky for little mouths. Fabulous result and so pretty in those lovely bottles. I like the look of the bullhorns, they look like serious business, but have a lovely sweet taste. I’m sold. Will give this a go for sure. Your bottles look stunning, gloriously red and all dressed up. Ah and Sally Wise – I made her Roasted Capsicum Sauce last year which is now all gone. Total triumph and it even won me a second place ribbon at the local show. Yours looks worthy of a prizewinning blue. I love your preserve posts. It makes me think of the “farmgirl” in you. Sally Wise really is the bees knees isn’t she? After seeing her demonstrate a few simple dishes last year in Tasmania, I’m sold on all she has to share. No idea what sort of chilli that is, does it refer to the shape? Or do you take the bull by the horns when you dare to eat it? I think the bull horns are known more as sweet pepper Joanna, or capsicum. No heat at all when you eat it, although looking at it they do look rather fiery. All the heat is in the little chilli though, and they ARE fiery little buggers. 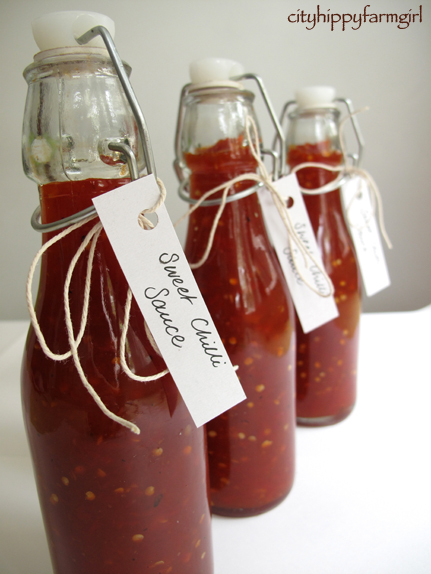 I love the look of your sweet chili sauce…they would make beautiful hostess gifts. I will definitely be making your recipe this summer when I harvest chilies from my garden. I just made out of boredom a freash chilly, garlic and ginger mix … njammies. Gonna try this this afternoon. I hope you won’t mind if i give this recipe to my cousin a chilly farmer? I did try your recipe last night .. it worked well BUT .. the only chillies i had in the house was 50% dry. The procedure says ginger – how much do I need please. Yum this looks great, I made a cut down version (portion wise) so fingers crossed. If it works I want to make for Christmas presents. Any tips on preserving/making it last- someone suggested I use new jars rather than sterilize old ones? Hi Angela, thanks for dropping by. I’ve always just used old jars for any of my preserving, and had no problems with them. The chilli sauce I just make a big batch and then it goes straight into the fridge ready for eating. How did the smaller batch work? Hey hey yes us city chicks who are country girls at heart! The chilly saue was a smash hit with my brother who’s been living in Indonesia and likes it hot!! I used apple cider vinegar as that’s I I had. Hi there, Just letting you know that I have been making variations of your chilli sauce throughout summer – in fact, I have a pot simmering away on the stove as I type. Great recipe and great taste, thanks for sharing. Great sauce …I had red capsicums from the garden …grilled them first and removed skin …labor intensive… but great flavour.. Wonderful Dianne. It’s such an easy recipe and always jazzes up a dish. Just a nice big chunk Pauline. Say the size of your thumb?